The construction of Turkey's first nuclear power station, the Akkuyu Nuclear Power Plant, was launched Tuesday in a groundbreaking ceremony attended by President Recep Tayyip Erdoğan and his Russian counterpart Vladimir Putin. In his first trip abroad since re-election last month, Putin arrived Tuesday in Ankara to take part in the ceremony and a summit on Syria the following day. He met Erdoğan eight times in 2017 as relations between their countries improved amid cooperation on energy and Syria, and as Ankara faced headwinds in its relations with the West. 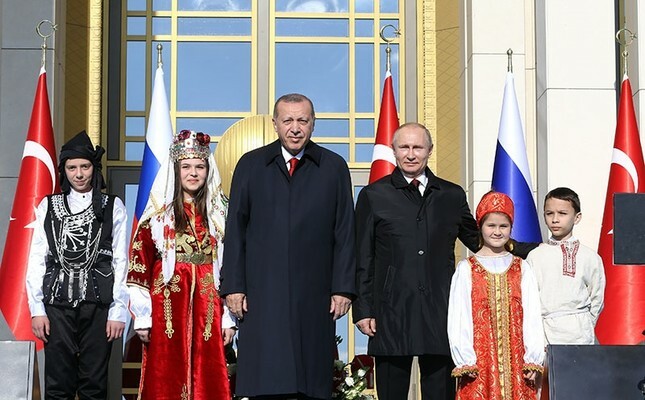 In the ceremony held in the Presidential Palace Complex, Erdoğan said that Turkey implements various strategic projects with Russia, with the S-400 air missile defense system, the TurkStream gas pipeline and the Akkuyu Nuclear Power Plant only some of these. "When all four units are activated, Akkuyu NPP alone will able to provide 10 percent of Turkey's electricity needs, bringing our energy portfolio to a healthier level, which is currently largely dependent on oil, gas and coal," Erdoğan said. Putin stated that successful implementation of the Akkuyu Power Plant project will be a symbol of the dynamic development of Turkish-Russian partnership and of the two countries' friendship. "The Akkuyu Nuclear Power Plant is a new step to further develop Turkish economy," Putin said, adding that more than 350 Turkish companies are ready to participate in Akkuyu Power Plant project implementation. Turkish Energy Minister Berat Albayrak said that in addition to efficient energy, Akkuyu Nuclear Power Plant is a milestone for Turkey in energy and technology, as its nuclear capacity in areas from industry to agriculture, satellite communication to health is concerned. Russia is the top provider of natural gas to Turkey. According to government agency TurkStat, Turkey spent $37.2 billion on energy imports last year, a 37-percent increase compared with 2016. Both presidents watched via video conference the laying of concrete at the $20-billion power plant in southern Turkey, which is supposed to go online in 2023. The nuclear plant deal is part of wider energy projects with Russia, including the TurkStream pipeline, estimated to be worth more than $12 billion, which will deliver Russian gas to both Turkey and southern Europe. Russia's Rosatom holds a 51-percent stake in Akkuyu and is seeking to sell the other 49 percent. Prospective Turkish companies pulled out of the project in February. The talks on Syria, which will be joined by Iranian President Hassan Rouhani, will focus on humanitarian issues and creating de-escalation zones, a Turkish official said.